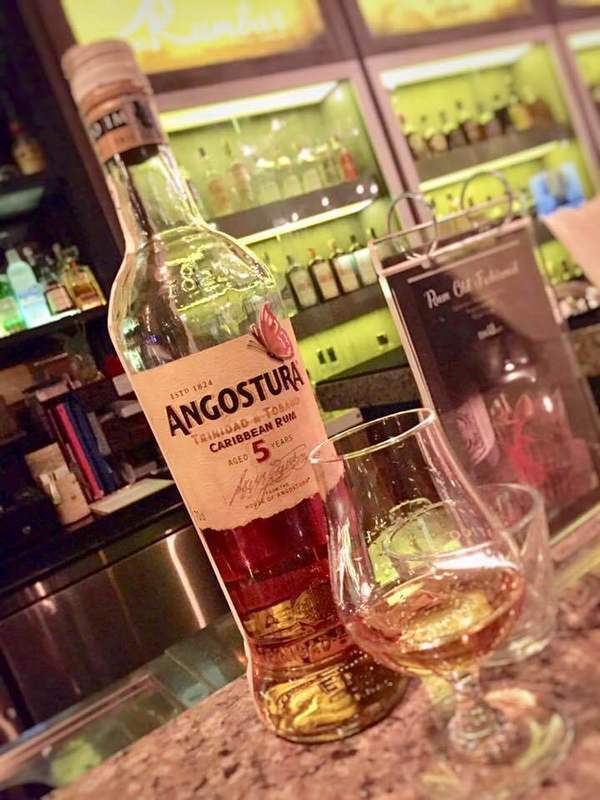 Have you found an online vendor selling Angostura 5-Year? Plne souhlasim s hodnocenim, co psal HunterRomario. Vune i chut prijemna. Dub a med s prijemnym dokoncenim. Radeji bych ale tenhle kousek oxhutnal v sudove sile, protoze opravdu pusobi lehce naradene. 5 or 6 i was not sure about it. It is not a bad rum but it is defi etely not on the must have side for me. If i catch it on a good sale i will buy again but above $20 i've tried better rums. Nose: oakiness and alcohol smell is very noticable. Taste: i know it will sound weird but it is a dry rum but it is sweeter than expected with honey caramel flavors. Tried both sipping and mixing same confusing results. Did not get best out of it. Picked it up for $15. Nose is molasses, caramel, vanilla, and spice. Apart from an initial alcohol bite, it is relatively smooth with some nice dry notes of wood and caramel with some spice. Vanilla teases too with an elusive sweetness. Actually not bad on its own, probably not bad with ice, though will most likely be mixed. You would expect to fell more pleasant rum for a rum made to be consumed on it's own. Sadly this rum lets you down and in the after taste you can only fell strong alcohol with caramel found. On the rocks or cola only in my opinion. This rum has a beautiful bright amber color. It has an interesting odor. A bit alcohol-heavy that stings the nose a little. Tasting it reveals the oak in which it is aged (between 5 and 8 years from what I've read online) and a little sweetness with vanilla and caramel with a drier finish. This will tingle your tongue a bit. Leaves a bit of a lengthy burn in the throat. A very versatile mixing rum. Has too much of an edge to it to be a good sipping rum. Overall a good rum and very useable in mixed drinks. Nose of vanilla, hint of oak and passion fruit. The palate strikes with a bit of funk, young barrel and slightly grassy fruitiness. A bit stinging, short finish, but as a mixer it has enough character. Try it in a Knickerbocker or any flavourful cocktail that adds some complexity, such as a fix or a punch. I found that this rum left me wanting something with a more complex flavor profile. It's smooth and mixes nicely. It's not offensive in any way and is something that I believe even non-rum drinkers would enjoy. It has a mild smokey Carmel flavor which the aroma doesn't tip you off to. Overall I feel like I need to try other rums from this brand to see if they can give me something more fulfilling. Now it’s much better. Alcohol aroma is much lower. Now I can find caramel and some tropical citrus. I guess whiskey lovers will like this rum. Before I started writing reviews here, I tried the Angostura 7 Year and absolutely hated it. This family of rums is so different from the more commonly marketed brands that one can easily be put off by trying one of these first. Now that I have an appreciation for their 1919 and 1824 with their very unique taste, it was time to give the 7-Year another try. The store was out of that one, so I gave this 5-Year a try for only $21. It is pale yellowish gold and exudes infancy. The same unique aroma of it's older brothers is apparent, but that is where the similarities end. It is a pretty smooth and dry rum, but it would be better suited to being served with ginger ale as I recommended for their 1919. So this one is too young and the 1824 is too rich and costly, which means that their 1919 is the best value for sipping. I just had to find out for myself. As an after note, mixing one part Angostura 5 Year with two parts ginger ale and served over lots of ice cubes in a tall glass makes for one very refreshing and unique tropical drink. If it were only $6 cheaper, I could also recommend it as a good bargain buy. I will still buy this one again specifically to make the drink just described. It's THAT good! But don't drink it neat or on the rocks! Still the old version with 40% vol, heard that the latest release of this are being bottled at 37.5%...global warming with higher angel share...? Doubt so. I had said that the plantiation had faint citrus, carmel and a white pepper flavour. This is missing the white pepper "spike" and the citrus is less faint but not at all overwhelming. Smoother with less complexity. Se boit bien, bon rhum pour le prix. Sans grande particularité mais aussi sans grand default. Λαστιχιά .... κυριολεκτικά και μεταφορικά (μυρίζει σα λάστιχο) ..... μια πιο light εκδοχή , του ήδη μέτριου 1919 ..... Επιεικής η βαθμολογία , σε σχέση με τα ρούμια που έχω βαθμολογήσει !!!!!! Πολλά καλλίτερα ρούμια σε αυτήν την κατηγορία !!!!!!! Just awful from the smell to the mess of a taste to the terrible afterburn. Stay away from this rat poison. Has a woody taste with hints of vanilla, oak, honey, caramel and spice. Not very complex due to the limited amount of time it has been aged. A nice mid range rum that can be enjoyed neat or mixed with your favorite beverage. Good price for another fine rum in the Angostura line. Det var denna som typ erbjöds i shopen på båten från Litauen. Smakar inte dåligt och inte bra så den hamnar i mitt skiktet. Går att dricka med Ginger beer. This makes a great mix, could sip in a bind. Glad I tried it, will definitely try others of the same brand. I dont understand why Bacardi is so popular, when here is Angostura, much more better than that. 5 year is average, nothing great, but nothing terrible, better for mix. not much to say about this the 5 year is tasty. carmel, vanilla. great mixer , decent sipper.